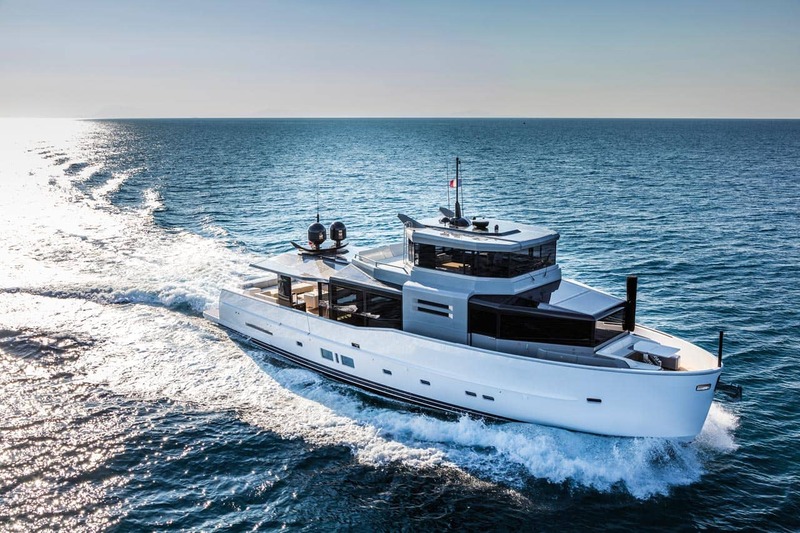 The Arcadia Yachts yard looks set to astonish the sector once again with the new A85S, a boat that delivers an incredibly generous amount of guest space for its 25.9-metre length. The layout and functional aspects of the living space aboard the A85S are the result of a deliberate evolution of the yard’s construction processes. The linear design of the superstructure and vertical line of the bow guarantee optimal use is made of every single inch of available space, both interior and exterior. 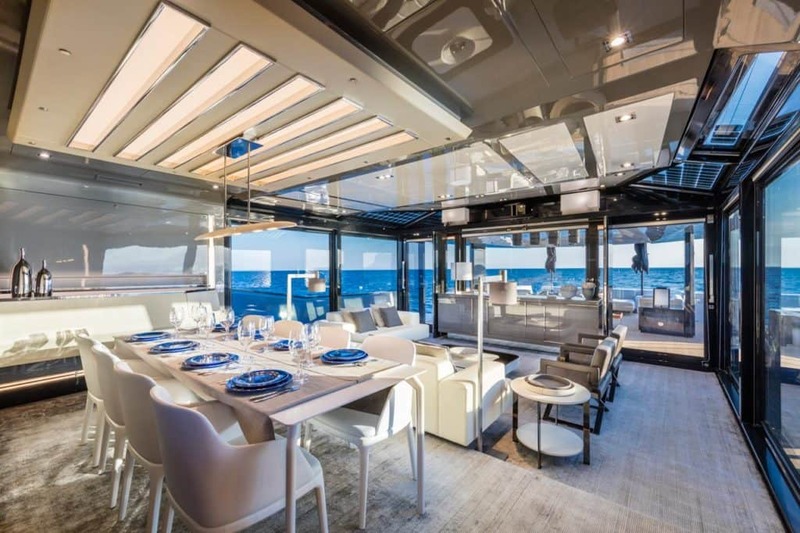 The perfect case in point is the exceptionally generous living area which is significantly larger than that found on other yachts of the same dimension and, in fact, results in around 100 square metres of communal space on the main deck alone. 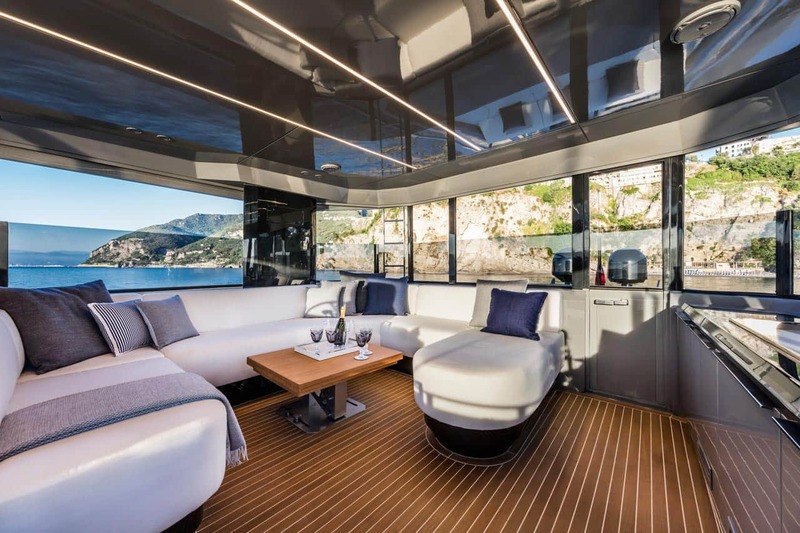 The A85S features the innovative sky-lounge concept which can convert to a third entirely enclosed deck, complete with Up & Down side windows that rise all the way up to the hard top at the touch of a button. This makes the whole of the upper deck much more flexible and usable in all kinds of weather. In design terms, the A85S is simple and sober in style, featuring a harmonious mix of interior and exterior areas with the confines between the latter blurred to the point of barely existing. The enclosed spaces, in fact, seem to meld with the surround nature and sea. The heady scent of the sea, its soft sounds and reflections off the water flood the interior, creating the feeling that it is one with the elements. The deckhouse is almost entirely comprised of double-glazed reflective glass, lending the interior a bright airiness. Automatic blinds on the ceiling and side windows offer the owner and his guests complete privacy in port or even riding at anchor out in a bay. The elegant winter garden leads to the spacious aft-deck lounge which is 8.5 metres in length and has a nicely-sheltered cockpit with a second table that’s perfect for suppers and dinners as well as a large sunning area further aft. The exterior aft deck is itself well-sheltered and offers guests an excellent alternative to the interior. One of the A85S’s strongest attributes is, without a doubt, its exceptionally modest fuel consumption, which is an impressive 30-50% lower than other yachts of comparable dimensions. The same applies to its running costs. These results were delivered by its semi-planing NPL hull. At 25.9 metres in length, the A85S has a maximum displacement of 75 tonnes. It also sports twin 730 hp MAN diesel engines which guarantee a maximum speed of 18 knots. The new yacht cruises confidently at 16 knots too. Equally, it can cruise in displacement mode at the slightly lower speed of 12 knots to allow those aboard to experience an even greater sense of connection with the sea, savour the sea breeze on their faces and enjoy the most pleasurable part of any cruise: simply being underway. The A85S has a range of approximately 850 nm @ 12 knots. The A85S will be in good company on the water at the upcoming 2017 Cannes Yachting Festival (September 12 to 17). In fact, the Italian yard will be bringing its entire fleet from the Sherpa to the A115 flagship, via the A85 and the A100, to the event.